professional clubs through participation in this program! Coaching Mini Soccer (5 - 10 years) book contains a complete and proven full season training program comprising 12 main sessions and over 70 interchangeable drills to coach the skills required to produce academy standard players and teams. FACT - eight players in the last three years have been signed by professional clubs through participation in this program. In its basic form the program can be used by grassroots youth clubs for coaching skills in their soccer academies, community soccer programs, after school programs, or by primary school teachers as a term based program. As the players develop through the program and form Mini-Soccer teams the coach can draw on the programs tactical games to aid formations and small sided games to improve creativity, game awareness and problem solving. Bonus drills are also included as the program matures with the players providing an easy to follow and proven structure for any club, team or school to follow. This is simply the only book any coach of players between 5 and 10 years will ever need to provide proven training sessions every single week. In 2010 the local Championship Club took 5 players at U9 from its home city, 3 of them were from Coundon Court FC this made 8 players in three years signed by two different professional clubs and all coached using the program in this book. Coaching Mini-Soccer is specifically written to be the only book any coach of players between 5 and 10 will ever need to provide proven training sessions every single week. Richard Seedhouse first book, " Coaching The Coach" has been nothing less than a phenomenal success. It has been the UK's number 1 best selling coaching book in the soccer skills and drills category since its release in 2007 and has gone on to sell thousands worldwide. Richard now submits articles for World Class Coaching Magazine as a "Youth Development Expert". And just recently signed a mutli-year contract with SoccerTutor.com releasing the 1st book - "Coaching Mini Soccer" based on a very succesful youth development program. Richard is a UEFA B Coach, JFO Tutor and Coach Mentor who is also on two County FA committees for both Raising Standards and Coach Mentoring. 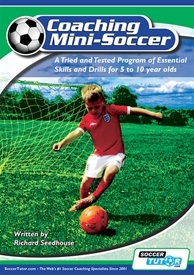 Coaching Mini Soccer is very excelente book from me. The book is well written and easy to understand . It is fairly easy to modify the sessions depending on the level of the players, it also gives hints on how to do this. A great programme to work to. Excellent book, my team of 6 year olds loved the drills. Gave me fresh ideas, allowing me to add my own variations....and take the credit!